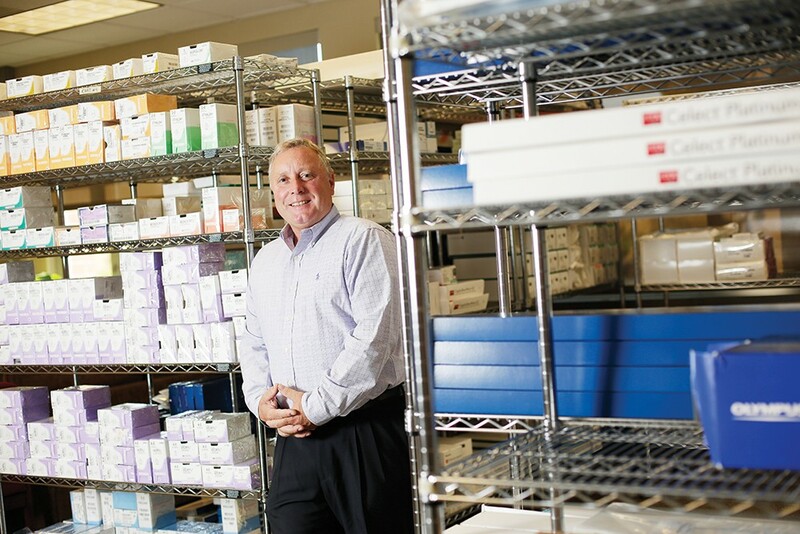 Murray Walden's Spokane company, H-Source, provides a marketplace where hospitals can resell and purchase medical supplies. Inside a sealed glass jar, a tiny white heart valve wastes away. The single valve, which looks a little like a pulled tooth with the roots still attached, costs between $5,000 and $8,000, says Murray Walden, president of the Spokane-based company H-Source. As it sits there, it's a perfect example of the large-scale, expensive waste inside hospitals. Walden is trying to find a solution. His company is an online marketplace that allows hospitals throughout the United States to buy and sell their surplus supplies and equipment. Think of it as an Amazon for hospitals. Rather than let that heart valve expire and go unused, "Why not put it on a shelf where it will get used in a day?" Walden says. "Because maybe that patient walked through the door last night, and you needed it." Through the H-Source marketplace, the idea is that smaller, poorer hospitals can shop online to purchase supplies they otherwise couldn't afford. And the mounds of extra equipment that bigger hospitals don't need doesn't have to sit in storage, and ultimately be thrown away. 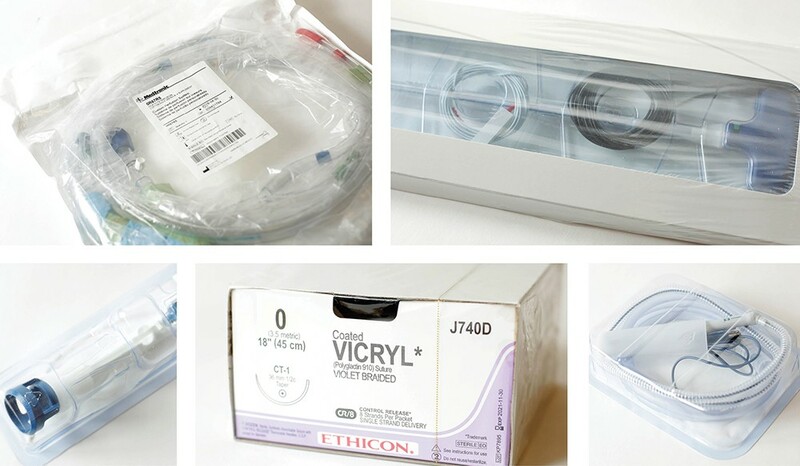 Medical supplies, still in their original packaging, are ready for purchase by hospitals participating in the H-Source marketplace. For all the good that hospitals do, they are notoriously wasteful — both in terms of supplies and energy use. They can also be major sources of harmful pollution. As Republican lawmakers bicker over the Affordable Care Act and how to replace it, the majority of Americans simply want out-of-pocket costs to go down, according to a recent poll by the Kaiser Family Foundation, a nonprofit that tracks and analyzes health care policy. Although exorbitant energy bills or dollars spent on unused supplies don't show up in patients' bills directly, those costs drive up a hospital's overhead, ultimately inflating the overall cost of health care. That's why local hospitals are looking for ways to save money and reduce their carbon footprint. "That's kind of become the mantra of health care," says Ben Myers, director of facilities for Providence Health Care. "If we have items that are still useful, we don't want to throw them away. We want to try and reuse them." As a medical supplies sales representative for 15 years, Walden saw the same problem in hospitals across the country. "I was in Seattle, Portland, Salt Lake, Billings, Anchorage, and it dawned on me," he says. "Return policies are rigid for a very high percentage of those products." So the supplies and pharmaceuticals just sit there, unused. Some of them expire. "We can provide the tool for hospitals to communicate," Walden says. "To move those assets and find products that they need, and drive down health care costs." There are several reasons that hospital supplies and equipment pile up. Often, manufacturers will only sell in bulk, Walden says. A hospital is forced to buy 10 of one device, when they only intend to use eight. Physicians contribute to the buildup of supplies as well. "Every manufacturer has a different variation and modification of their product," Myers says. "One doctor will like Brand X, but the other likes Brand B." So hospitals order several different kinds of a product. Then, when the physician who preferred "Brand B" leaves, those hospitals are left holding the bag. "That can go on with multiple things: hernia mesh, valves, coronary stents, drugs. There are certain types of drugs that some people believe give patients better outcomes, so they stick with it," Walden says. "You put 1,000 doctors under one roof and try to say, 'Where we can find common interest?'" He points to a study of waste in operating rooms in one California hospital. Researchers at the University of California, San Francisco concluded that nearly $1,000 was wasted during each procedure included in the study. That equates to about $243,000 per month, and around $2.9 million wasted per year, for just one department, the study shows. Another contributor is hospitals' inability to communicate with each other, Walden says. Even facilities under the same ownership don't necessarily share the same software that tracks their inventories. While Foot Locker can check to see if its store in Seattle has the pair of shoes you're looking for, some hospitals can't do that with medical supplies. Hundreds of hospitals buy and sell on H-Source's marketplace, Walden says, and the network continues to grow. Myers, the facilities director for Sacred Heart Medical Center, St. Luke's Rehabilitation Institute and Holy Family Hospital, says that Providence is currently working on a contract to join H-Source's network. "We have quite a bit in storage that collects over the years, yet still has useful life in it," Myers says of the approximately 10,000-square-foot facility holding Providence's extra supplies and equipment. "H-Source did an initial walk-through, and we're negotiating to have them come back and do a more thorough inventory." In some ways, extra supplies come with the cost of doing business for facilities that treat thousands of different people for at least as many ailments in an industry where the newest, most up-to-date equipment is associated with the quality of that treatment. That's why, for Walden, one of the biggest challenges is getting hospitals to rethink how they purchase supplies. "Hospitals are buying entities," he says. "They've never thought of themselves as selling entities. And part of that is because they've never had a resource — nothing quite like us has ever existed." So far, 700 items have been sold on H-Source's marketplace, Walden says. Neither the VA hospital in Spokane nor MultiCare Health System buy and sell on H-Source's platform. But both participate in programs to reuse old materials. In just the past eight months, MultiCare Valley Hospital in Spokane Valley has saved about 20,000 pounds of supplies from the landfill, says Michael Hanf, the hospital's director of material management, by sending it to Stryker Sustainability Solutions. The Arizona-based company then cleans, repackages and resells the devices. So far this year, the repurposing program has saved Valley Hospital about $85,000, Hanf estimates. Deaconess has saved about $103,000. As for H-Source, since 2012 the company has grown to 15 employees and continues to add hospitals to its marketplace. Walden says there's no limit to where they can go. It's not unreasonable to say that someday they could expand into Europe, he says. Hospitals come with a hefty carbon footprint. "If the U.S. health care sector were itself a country, it would rank 13th in the world for [greenhouse gas] emissions, ahead of the entire UK," according to a 2016 report by researchers at Northeastern University and Yale University, which estimated that in 2013, the U.S. health care sector accounted for nearly 10 percent of the country's total greenhouse gas emissions. A 2012 survey by the U.S. Energy Information Administration estimates that hospitals are the second most intensive users of energy among commercial buildings. Local efforts to lessen medical facilities' impact on the environment include new, more efficient lighting, the use of digital records, rather than paper, and even switching to biodegradable kitchen utensils. For the past decade, Providence Health Care has partnered with facilities in Oregon, Montana and Alaska to share their progress, discuss what's working and brainstorm future ideas to lessen their impact on the environment. They're called "Green Teams." "The team is made up of folks throughout the facility," says Ben Myers, who leads the team for Providence. "Nursing, a representative from St. Luke's, housekeeping... nutrition management." Some of the Green Team's initiatives include installing 20,000 LED lamps, which are expected to last 10 years and save approximately $146,000 annually, Myers estimates. They've also installed motion-activated lights and "variable frequency drives," which control the energy sent to the hospital's equipment. Rather than sending a full amount every time, the drives give devices only as much as they need. In 2014, the Green Team in Spokane earned the Spokane Regional Clean Air Agency's Clean Air Award. As a result of its efforts, Providence boasts a combined 544 tons of recycled paper, batteries and fluorescent lamps, cooking oil, electronics, medical supplies and sharps containers. The Green Team's Commute Trip Reduction program also eliminated an estimated 20 tons of carbon dioxide production and about 100,000 vehicle trips for the five years before 2014, according to a news release. Other area health care facilities have similar initiatives — replacing lights, updating heating and cooling systems, and recycling as much as they can, says Chad Weidert, Deaconess Hospital's plant operations manager. "We recycle at least 600 pounds of batteries each year, and about 1,200 pounds of hazardous materials," says Weidert. The Green Environmental Management Systems, or GEMS, at the Mann-Grandstaff VA Medical Center is part of a nationwide program that gives guidance to veterans' hospitals. GEMS manager Laura Sliger says the program touches nearly every aspect of the VA hospital's operation. The hospital has reduced the quantity of harsh chemicals used to clean various instruments, installed more efficient lighting and, like Providence, encourages employees to carpool, ride a bike or take public transportation to work. That program has eliminated 174,000 miles driven in cars, and 9,600 pounds of carbon dioxide from 2015 through 2016, according to figures provided by the VA hospital.